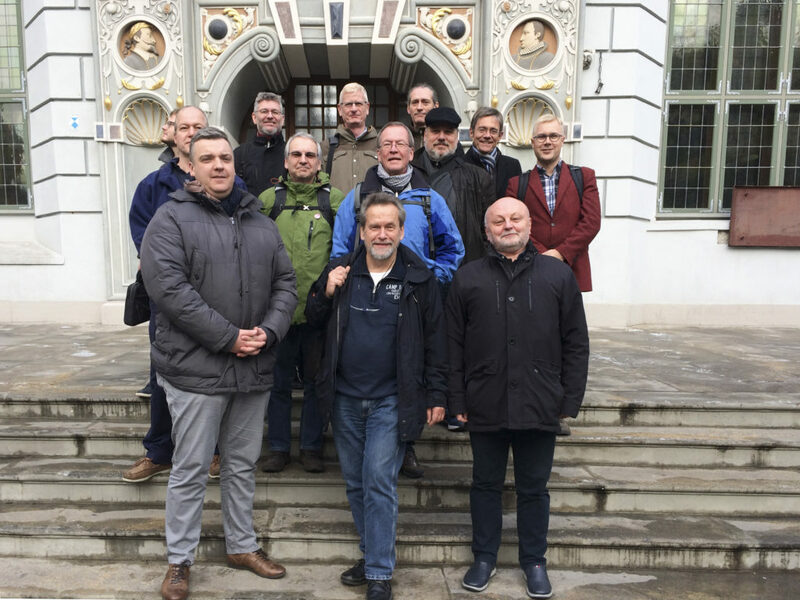 The SEAMOUNT team presented promising scientific results and technological progress in Gdansk in november 2018. The Baltic Sea nutrient and water cycle may be significantly affected by groundwater from land seeping into the bays and causing a lot of trouble for the marine life. Scientist are now beginning to understand why. After the first season of field trips in the BONUS SEAMOUNT project, scientists have found new potentially important contaminant pathways contributing to the deterioration of the Baltic Sea. In November 2018 the partners of the project gathered at the coast of the Baltic Sea in Maritime Institute in Gdansk, Poland to exchange and debate their findings from the first year of field work. The two-day meet up revealed that the team has gotten closer to finding an important “missing link” in the nutrient and pollution cycle wreaking havoc in the Baltic Sea, which is known as one of the planet’s most hypoxic and anoxic marine areas. Because of that, it is now one of the largest dead seafloor areas currently known, globally. “Our results indicate that shallow and deep SGD is more widespread than previously known. Now, one of our main goals is to quantify the amount of deep SGD and especially to determine the size and nature of the nutrient load within it”, said marine geologist Jan Scholten from Christian-Albrechts-University (CAU) in Kiel. SGD sites have been found and documented in the German part of the south-western Baltic Sea (e.g. Eckernförde Bay) according to Jan Scholten. “That’s why we picked this area for testing and calibrating the novel technologies of this project, because chances of testing them on actual SGD were good”, he explains. However, SGDs in Finland and Denmark have never been documented before, he explained. Therefore, scientist from both countries joined in to investigate local possible SGD sites. The marine surveys conducted off the southern coast of Finland showed clear evidence of SGD and the surveys in Horsens Bay in Denmark showed weak indications of possible SGD. Now, the team hopes to perform more detailed investigations in Horsens Bay in May 2019 and possibly confirm the indications of SGD in this area. “The impact from SGD on contaminant and nutrient load in the Baltic Sea has not been investigated systematically, and therefore our current models and legislation regarding these key factors may well be incomplete,” he said. The underwater drone in the shape of a manta ray. Besides looking like a manta, it swims just like one too. Here the drone is tested in the Baltic Sea. The orange cap is a transmitter. The drone comes in the shape of a squid too. A way to increase our knowledge on the SGD impact on the marine environment is to find a way to get more data. This is the objective of the second part of the BONUS SEAMOUNT project, carried out simultaneously with the scientific research. The goal is to make underwater drones do the hard work of collecting data. Instead of spending huge amounts of money and time renting research vessels and waiting for calm seas, scientists will then be able to drop these drones in the water and sit back at the lab collecting data from them while they scan the sea for clues and indications of SGD. Hereby the drones are enhancing the amount and hopefully quality of information a project as BONUS SEAMOUNT is able to collect in the three-year period the project lasts. 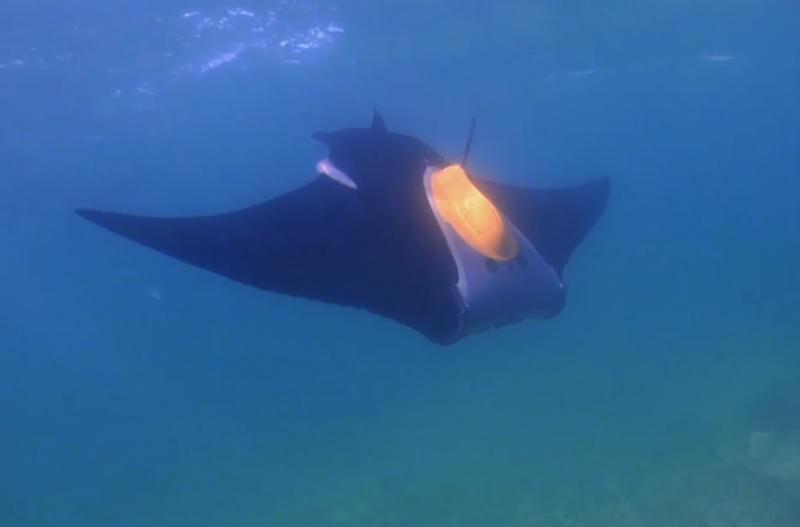 The drones are shaped like manta rays or squids to immitate the animals energy efficient transport through water. According to the engineering partners of SEAMOUNT the testing and fitting of scientific equipment in the submarine drones this summer had also gone well. They showed several videos of the “training” of the manta ray shaped robots in the Baltic Sea from which a picture is shown to the right. “They performed well and were able to swim effectively even loaded with the heavy equipment that we need to apply for the identification of the SGD’s,” said Dr. Rudolf Bannasch. He explained to the participants that the manta shape was chosen due to the animals’ perfectly streamlined and energy effective body plus the idea that an animal like drone would cause the least disturbance to the marine environment. Instead of large machines operating the water column, the team preferred to create a device that would go largely unnoticed by other marine life. Both researchers and technicians are now looking forward to getting in the field in spring and summer of 2019 and finding out more about the hidden groundwater in the Baltic and further drone testing. In addition, the BONUS SEAMOUNT team is also working on a common database where results and data from this and future projects will be made accessible to the public and all relevant stakeholders. the Baltic Sea Science Conference 19-23 August, 2019 in Stockholm.